When Star Wars starts screening for the masses later this week, the internet is going to be full of spoilers. Hell, after last night’s premiere, it probably already is. But don’t worry: this Chrome extension will keep you safe. 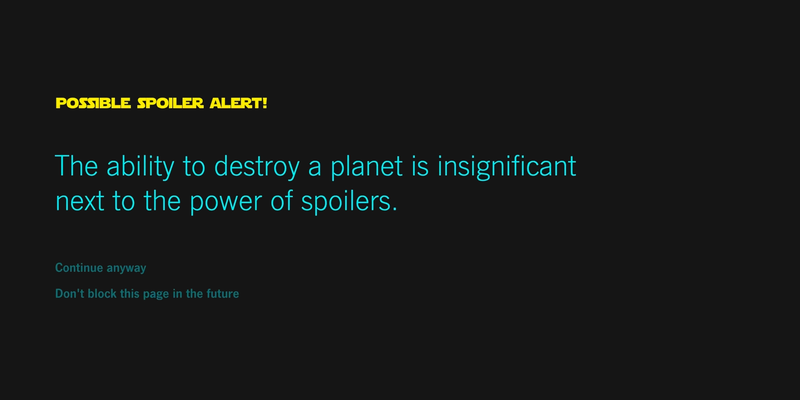 Called Force Block, the extension will “block pages containing spoilers from Star Wars: The Force Awakens, with smart pattern detection and a whitelist for false alarms.” When it detects the potential for a spoiler, it displays a suitably Star Wars-esque warning, shown above. This may just make the next few days online bearable.